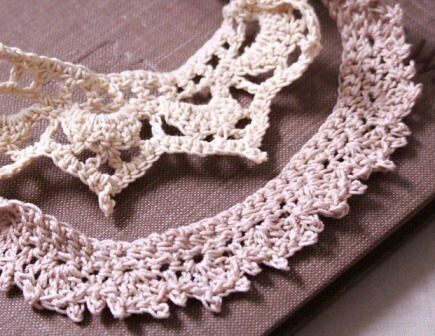 Crochet trim, originally uploaded by gilfling. Well it is nothing short of chaos in this house at the moment - all the boxes for packing were delivered the other day and left me with an impending sense of panic. After all - if we were struggling to find room to put the 'flat pack boxes' - how on earth were we to find room to stack the full and 'ready to be moved boxes'??!! Two weeks today and we will be on our way to our new home and hopefully a greater sense of order and space than we have now. Meanwhile we are making choices about what we need in the next two weeks and what can be packed away and as the ultimate procrastinator this is no easy task. Although I have a 'must do list' in terms of both aspects of my work - all else is really being put aside till after the move, so no room for painting or creating really. But I do hope to get the new 'studio' organised as quickly as possible as I have lots planned for the near future! Above is a wee sneak preview of a collection of hand crocheted trims (soon to be hand-dyed) which is part of a collaboration with Debbie Bryan. These will be displayed in her new shop as part of a 'haberdashery' collection along with her beautiful buttons and hand dyed nottingham lace - all created in harmonious colour palettes for anyone wishing to personalise an outfit for a more unique look. Exciting times! It is also a great project to be working on at the moment as crochet is so transportable and compact therefore lessening the amount of 'stuff' I have to work on and carry about at the moment. Just a wee reminder too of my give-away! Anyone who pops on over to my new website then returns to leave a comment/critique (please be honest) on my blog before end of day on Monday 8th June (really whenever I get up on tuesday morning to allow for time differences etc) will be entered in a draw to win a print of their choice - the full list of prints is listed here on this page so make sure and leave the title of your choice of print (should your name be drawn) and I will be announcing the winner on Tuesday 9th! I am soon to be adding a shop/shopping cart to my website but perhaps not till after the move so will keep you updated on that. We are off to this event on Sunday (as an early birthday outing for me and a rest from the monotony of packing boxes) so hoping for good weather - have a wonderful weekend! Your web site is very nice. It made me aware of all your fab arts (which I didn't know you had). Thanks. Your blog and great arts is like looking at a magazine. I found you by following blog-links on Mousenotebook...you are very talented in several areas. I think that your website is well organised and easy to navigate, and shows the different aspects of your work clearly. It would be hard for me to choose a favorite from among your artwork, but if I must, it would be "Collecting the Past" The colors and imagery are like something from a dream.